LEXINGTON, Ky. (Aug. 20, 2018) — What better way to spend your summer than by helping those in your community? That is exactly what University of Kentucky students in the Teacher Preparation Program in Visual Impairments within the UK College of Education did. 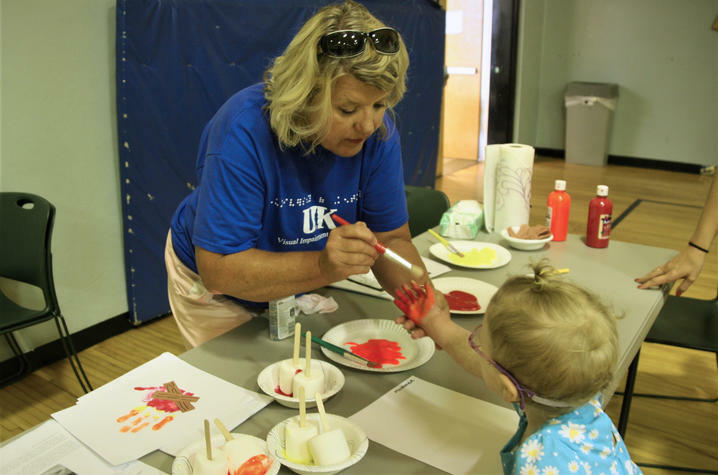 UK education students participated in the Visually Impaired Preschool Services (VIPS) Central Kentucky Summer Enrichment Camps. The mission of VIPS is to empower families by providing educational excellence to young children with blindness and visual impairments in order to build a strong foundation for reaching their highest potential. VIPS provides vision specific early intervention to children through home visits as well as through family support services such as the Summer Sensations camp program. Donna Rogers, a UK education student in the certification program, expressed how much the program meant to her as a future teacher of the visually impaired. "The summer camp is important to me because it helps me understand the kids' backgrounds before they enter public schools, which is where I will interact with them in the future. I love the hands-on experience, especially with the families. It's important to get the kids involved and incorporate skills across all settings at this age." Donna Brostek Lee, clinical associate professor in the Department of Early Childhood, Special Education and Rehabilitation Counseling as well as a coordinator of the program, also sees the importance of UK students participating in the program. "We have to prepare our future teachers of the visually impaired to work with all ages and disabilities and understand that impact of vision loss on early development. Young children who are blind and visually impaired need to learn basic concepts of the world through hands-on interaction." The camp this summer hosted campers from 12 months all the way up to 13 years old. VIPS' most recent camp was themed "A Day at Camp" where campers who are blind or visually impaired and their siblings were able to participate in activities that allowed them to explore using all of their senses. This included stations where the kids could make trail mix, create campfire paintings using their handprints, explore a tent, as well as many other sensory activities. UK students helped set up the activities and interacted with the campers and their families. "We wouldn't be able to do this without volunteers, so we are very thankful for the UK students," Kelly Easton, the regional director of VIPS, said. VIPS is the only agency in Kentucky that provides regular and ongoing vision specific early intervention to children, birth through 5, who are blind or visually impaired. They serve both the Commonwealth of Kentucky as well as the entire state of Indiana. They have three offices located in Louisville, Lexington, and Indianapolis. Diana Hellard, a mother of two campers, is just one of the many people thankful for the program. "I knew nothing when my oldest child was diagnosed. VIPS has let us meet other families with the same diagnosis, and it has had a huge impact on my children's literacy. VIPS has been able to adapt books so they can still enjoy them." For more information about the VIPS agency visit https://vips.org/.